rec. Gabrielkirche, Ismaning, Germany, 18-21 April, 2016. DDD. Although Haydn is no longer credited with being the ‘father’ of the string quartet or the symphony, it’s remarkable how well even his early essays in these forms sound and the Goldmund Quartet give us a selection of three quartets from his early, middle and late periods to demonstrate how well he began yet how much his work developed with each incremental step. Those looking for an introduction to Haydn’s quartets, perhaps having discovered and enjoyed his symphonies, should find that this is what they were looking for. 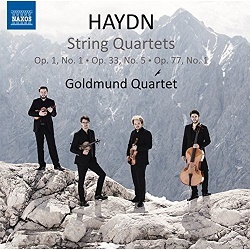 Though its young members have worked together for some time, this is the first recording to have been made by the Goldmund Quartet – not to be confused with the Goldmund Trio: no relation – and it’s an auspicious beginning which I enjoyed very much. They have the measure of Haydn from all three periods and I hope to hear more of them in his and other music. Naxos have a knack of discovering new talent and they are not afraid to duplicate repertoire which they have already visited. They recorded a complete series of the Haydn quartets from the Kodály Quartet many years ago and that remains a benchmark among budget-price recordings. Their CD of the three named quartets from the Op.76 set was the first Naxos CD that I bought – in those days to be found among a motley collection in Woolworths for £3.99. That remains available on 8.550129, made separately from their complete Op.76 (8.550314 and 8.550315). The Kodály Quartet recordings are also available as a complete set on 24 CDs for as little as £60, one of the best bargains in the catalogue (8.502400). Unless you must have period-instrument performances these remain my benchmarks. The Goldmund Quartet never take Op.1/1 lightly, though they are consistently faster than the Kodály Quartet, except in the second minuet, where honours are about even. This easy-going five-movement work grew out of the divertimento and serenata forms; the Goldmunds tend to stress the former, the Kodály the latter, though I enjoyed hearing both, especially as it’s some time since I visited Op.1. There’s rather more bloom around the Goldmund Quartet. Though that’s probably mainly due to the improvement in recording techniques between 1991 and 2016, not even the best tonmeister can add what isn’t there. The older CD is better value, however, with four works (Op.1/1-4) and 75 minutes playing time; even at budget price 56 minutes for the new CD is a trifle mean. The Hagen Quartet on DG at full price offer even less music, with Op.1/1 coupled with Op.64/5 and Op.74/3, a total of 55 minutes (4236222, stream, download or Presto special CD ). Though their tempi match those of the Goldmund Quartet almost to the second, they tend to sound a little hurried by comparison. The Op.33 works are generally reckoned as marking the beginning of Haydn’s mature quartet style and competition is very keen. My first choice for the whole set would be the period-instrument Quatuor Mosaïques (Auvidis Astrée/Naïve E8801, 2 CDs, stream or download only) and Cuarteto Casals (Harmonia Mundi HMG502022/3, 2 CDs mid-price – DL News 2014/11 ). Among the many performances on modern instruments the Kodály Quartet are again very reliable (8.550788 and 8.550789, with No.5 on the latter) and I liked the London Haydn Quartet on a 2-for-1 set from Hyperion better than some other reviewers (CDA67955 – DL News 2013/12 where I inexplicably referred to them as the London Haydn Trio). Cuarteto Casals adopt a very brisk approach to Op.33/5 – brisker in every movement except the scherzo than the Goldmund Quartet, who match them in that movement. The more incisive sound of the period instruments lends itself well to these lively tempi. Quatuor Mosaïques, also on period instruments, adopt a more leisurely approach throughout than either group. At first, played immediately after Cuarteto Casals, their account of the first movement sounds slightly ponderous – almost as if they were ignoring the second part of the marking allegro assai – but their overall interpretation is convincing and the set of all six Op.33 quartets is well worth downloading from Qobuz in lossless sound for £8.79 (NO booklet). Subscribers can stream them, as also can subscribers to Naxos Music Library. Against the two period performances the modern instruments of the Goldmund Quartet sound less incisive but fuller in tone, which some may prefer. With sensibly judged tempi this is building up to becoming an attractive cross-section of Haydn’s string quartets. By the time that he published the two Op.77 quartets in 1799 some of his erstwhile student Beethoven’s Op.18 set, with its prefiguring of his later great achievements in the form, were circulating, though not published until 1801. Haydn’s six quartets of Op.76 had demonstrated a more profound style but Op.77 go further: the master was not averse to vying with the pupil, as the two sets of ‘London’ symphonies (1791-1795) demonstrate, though the admiration was by this time far from mutual. Once again it’s to the Quatuor Mosaïques that I turn for the two Op.77 quartets, coupled with the final fragmentary Op.103 on Naïve E8800 (stream or download only). They find greater depth than the Goldmund Quartet in the adagio second movement of No.1 but there’s very little wrong with the latter. The Kodály Quartet dig a little deeper still and their 1994 recording sounds fuller than their Op.1 from three years earlier. That remains my budget-price preference, though at 51 minutes it’s even shorter than the new CD. Typically on sale for around £8, Naxos CDs are no longer quite the bargain that they once were, though you should be able to find the older Kodály Quartet for a little over £6 and the new Goldmund Quartet for under £7. As well as Keith Anderson’s notes – perceptive, as always – the booklet contains a discussion by the members of the quartet. I make no apology for having mentioned the period-instrument Quatuor Mosaïques frequently: their Haydn and Mozart recordings still seem to me to get it right more often than any other. Unfortunately they are no longer available on CD but several can be obtained as downloads very reasonably, as in the case of the 5-CD set of Opp. 64, 76 and 77 available for £14.49 in mp3 from 7digital.com. (£18.49 for lossless). Alternatively subscribers can stream individual albums and 2-CD sets from Naxos Music Library or Qobuz. The Mosaïques in Haydn may be special but the new CD is also well worth considering; it’s particularly recommended to those not yet familiar with his string quartet output. With attractive performances and good recording, however, it’s equally worthwhile for others.